5 January 2016, at 12:00a.m. NETHERLANDS - Dutch pork exports from January to September increased by 8 per cent to 638,700 tonnes, compared to the same period in 2014. Nevertheless, the average unit price of shipments from the Netherlands decreased by 11 per cent year on year, meaning the overall value of exports for the first nine months of 2015 fell by 4 per cent on the year to €1.19 billion. The EU remained the main destination for Dutch pork but its percentage share of exports was below 80 per cent , as the increase in shipments to non-EU destinations was greater than that of those to the EU. With 17 per cent of all Dutch pork exports going to Italy, it remained the largest individual country market. The second largest individual country was Germany, which imported 89,000 tonnes of pork, an increase of 12 per cent year on year. Shipments to Greece, the third largest destination, and the UK, the fourth largest, increased by 2 per cent and 4 per cent respectively. Outside the EU, China was the main growth market, with volumes increasing more than six-fold. Korea also recorded an increase of 46 per cent compared to the same point in 2014. Australia imported 34 per cent more Dutch pork than the year before at 13,900 tonnes but Dutch exports to Japan were down by 2 per cent on the year at 20,000 tonnes. 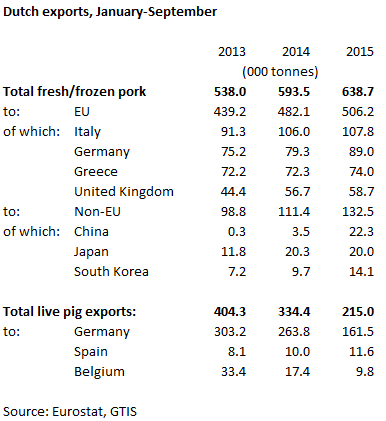 For the first nine months of 2015, Dutch live pig exports reduced by 41 per cent to 4 million head, compared with the same period in 2014. With more pigs being slaughtered at home, contributing to the increase in pork exports, shipments of all pig types decreased. Numbers of weaners and slaughter pigs decreased by 46 per cent to 2.5 million head and 29 per cent to 1.3 million head respectively.